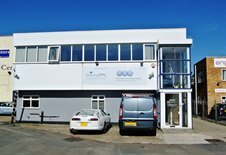 Cattaneo Commercial are pleased to announce the letting of the newly refurbished industrial unit at 10 Island Farm Avenue, West Molesey, Surrey KT8 2UZ, to Idolum Design Resources Ltd, makers of quality curtains, blinds and shutters. The premises comprise an industrial unit with two storey offices and 4 car parking spaces, totalling 2,750 sq ft.
We have a number of other industrial and warehouse units available in the area. For more information please contact either Andy Armiger or David Keates on 020 8546 2166.